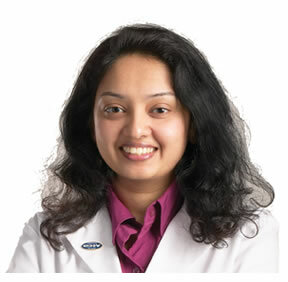 Dr. Jasmine Nabi is a medical oncologist, a physician trained in internal medicine specializing in the treatment of cancer with medicines, also called chemotherapy. She is a physician with Mercy Hospital’s Hall-Perrine Cancer Center in Cedar Rapids, and for the past eight years she has worked with patients at Virginia Gay Hospital in Vinton. Dr. Nabi is one of 29 specialists who provide patients the opportunity to have appointments at Virginia Gay Hospital. The other specialists with clinics at the hospital practice in the fields of podiatry, pain management, pulmonology, cardiology, psychiatry, neurology, GYN, orthopedics, nuclear medicine, ENT, nephrology, and urology. A point of professional satisfaction for Dr. Nabi is her commitment to understand the person, not just the disease.